OMG! The 80's are back! Come on, you know it! Neon is sneaking it's way back onto T-Shirts, icy synthesizers are making their way back to the radio airwaves, and Wall Street is in turmoil. Centerold has played: The HOUSE OF BLUES, SUSAN G KOMEN Breast Cancer Walk, LOS ANGELES MARATHON, USC, and many private corporate events. 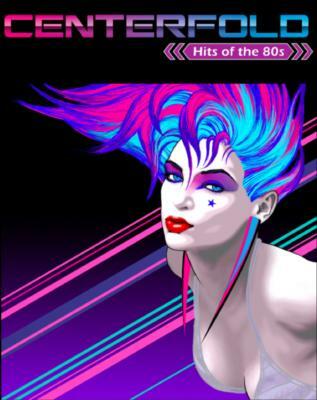 Let Centerfold take you back to the future with the best of the 80's! From New Wave classics from The Go's Go's "We Got The Beat" and Cyndi Lauper "Girls Just Wanna Have Fun", to Mullet Rock classics from Van Halen "Jump" , Journey "Don't Stop Believin'," Centerfold brings the memories back from the 80's in a big rock show! Our high energy performance is guaranteed to get you on your feet! Centerfold is a group top-notch performing professionals with many years in the music industry and demonstrate a high degree of talent, skill, reliability, and professionalism. Centerfold is available for clubs, corporate and private parties, weddings, casinos, and special events. We have the experience and professionalism to handle large events, including audiences up to 2,000+. We can also provide turnkey audio equipment, lights, and staging as needed for your event. We primarily cover greater Los Angeles but are available for travel. Everyone Loved them! Not just great musicians but great people too. So easy to work with Dax and the rest of the band. I would choose them again without looking anywhere else! The band is great! Super helpful with planning and they rock hard! Linda Casull is an awesome lead singer. If you 80s, they are the band to hire! Great working with Dax and the Centerfold crew. They were very accommodating and professional. Made the party that much more fun and our guests loved their energy and their talent. Highly recommended! Thanks again! Good time. Good variety of 80's music. Arrived early to set up which is always great. High energy Show. Lots of fun. I would recommend them. Centerfold was extremely professional and sounded amazing! Our employees normally do not dance but this time we had a packed dance floor! Centerfold exceeded our expectations and brought our company Halloween party to life. They each wore a Halloween costume and really got into character on stage. The lead singer was amazing and each band member was so talented. Our guests were truly impressed and could not stop talking about how much fun they had and how exciting it was to have a live 80s band perform. This was by far the best entertainment we've ever had at a company event. I highly recommend Centerfold to anyone looking for a professional 80s band to bring fun and entertainment to their party - I can't wait to have them again next year! What a great time. The band was early and ready to play, then they put on a great show. They played to the crowd and entertained while playing classic songs. The fee was fair and everyone who went to the party cannot stop talking about it. Thanks Centerfold. We had a grate time one of the BESTS band in So.Cal. Please note Centerfold Hits of the 80s will also travel to Los Angeles, Venice, Marina Del Rey, Pacific Palisades, Inglewood, Playa Del Rey, Beverly Hills, Culver City, El Segundo, Encino, Topanga, Hawthorne, Manhattan Beach, Sherman Oaks, Studio City, Hollywood, Lawndale, Tarzana, Universal City, Van Nuys, Hermosa Beach, North Hollywood, Toluca Lake, Valley Village, Woodland Hills, Burbank, Gardena, Malibu, Redondo Beach, Reseda.